Full-Disclosure, the reveal in this episode was semi-spoiled for me when I watched a blooper vid on youtube. I regret it because there is no freaking way I would have ever though that is who Dr.Whale was. In some ways it doesn’t make anysense. Ok, so we’re back to the three plot episode structure. Let’s start with our crew in the Enchanted Forest. Emma, Mary Margaret, Mulan and Aurora go back to base camp and everyone is dead. Everyone except for one, a blacksmith who is really Hook. Hook’s real name in this show is Killian Jones which is funny since Hook’s name is actually James Hook from the source material but whatever just going to call him Hook because between Mary Margaret and Rumpelstiltskin the monopoly on long names is taken. Emma’s lie detecting power return as she knows Hook is lying. He comes clean after they threaten him with death by orge. Hook and Cora are working together to try and get Storybrooke basically for revenge, the purest motivation. Hook then teams up with them to get a compass so they can gather the necessary magic to go to Storybrooke. The next step is up a beanstalk. In the character’s past Sith Lord Rumpelstiltskin is training his new padawan Regina. I’m sorry I really have been watching too much Star Wars, I regret nothing! But seriously, Sith Lord Rumpelstiltskin is training his new padawan Regina and she isn’t too willing to go full on dark side by taking a unicorn’s heart and crushing it. Regina is really only learning the dark arts to bring Daniel back from the dead. Rumpelstiltskin doesn’t have this power but Jefferson knows a guy who has powers beyond magic that could help. Jefferson introduces Regina to Dr.Frankenstein, yes this true, this happen, it’s not a coke dream. All Frankenstein needs is a heart. Regina gives him one from her mother’s collection but the process doesn’t work and Regina goes full on Dark Side. Turns out that Frankenstein failed on purpose to get the heart and so that Rumpelstiltskin could get his apprentice back, oh the intrigue. And in Storybrooke, Dr Whale brings back Daniel from the dead but he is a monster and Regina is forced to kill him. Also Rumpelstiltskin makes Dr. Whale admit that magic is way better than science. This episode aired on October 28th 2012 so it seems like the decision to make Whale Frankenstein hinged on Halloween but it seems like a weird mix to include Frankenstein. Especially since I thought the premise of this show was Fairy Tales/Disney movies but now they can literally throw in whatever they want to the story. Ultimately it adds more questions about the transportation, Jefferson’s hat can go to Frankenstein’s setting easily BUT somehow Jefferson never offers to send Rumpelstiltskin there? I mean Rumpelstiltskin must know that Frankenstein comes for a world without magic since they have snide remarks to each other about science vs magic. OR is Frankenstien’s world a different place? Because that makes it weirder since the book takes place in the real world. I shouldn’t have this many questions about this show. Not my favorite episode. 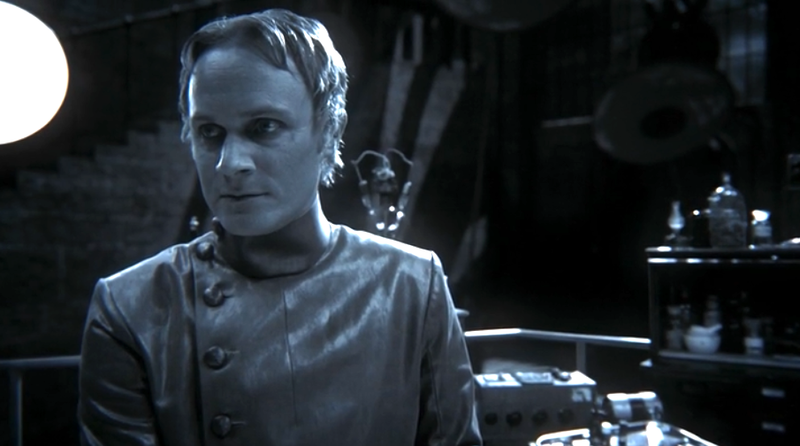 I did like Rumpelstiltskin and Regina’s interactions and David Anders’ performance as Frankenstein was pretty good but this episode was way too all over that place. Plus towards the end there were so many points where the episode could have ended and didn’t. Too many false ending.